The Rance Allen Group is a gospel music group formed in Monroe, Michigan and based in Toledo, Ohio. The group's incorporation of rock and soul into traditional gospel music prefigures the crossover success of such artists as Amy Grant, Andrae Crouch, and The Winans. The Rance Allen Group was formed by vocalist, guitarist, pianist, and songwriter Rance Allen (b. Monroe, Michigan) with his brothers Tom (drums) and Steve (bass guitar); another brother, Esau (percussionist), joined the group on an intermittent basis. :256 During an appearance at a gospel talent contest in Detroit, Michigan, they came to the attention of one of the judges, record promoter Dave Clark, who worked for Stax Records. :255-256 The group was the first to be signed to the Stax imprint Gospel Truth, and they recorded for the Stax organization throughout the 1970s. 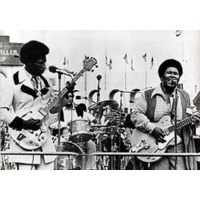 :256 In 1972, the group appeared in the documentary film Wattstax. :270 Following this appearance, the group was named "Best Religious Group" by the National Association of Television and Radio Announcers (NATRA). :272David Porter co-produced the group's 1975 album A Soulful Experience, for which he wrote an autobiographical song, "Just Found Me". :363 In 1978, the group had a Top 30 R&B hit, "I Belong to You."